Selected papers: Interconnect technology trend for microelectronics (R.Liu et al.). Factors which determine the orientation of CVD Al films grown on TiN (M. Avinun et al.). Study of Cu contamination during copper integration for subquarter micron technology (P. Motte et al.). The interaction of metals and barrier layers with fluorinated silicon oxides (S.E. Kim, C. Steinbrüchel). Cobalt silicide thermal stability: from blanket thin film to submicrometer lines (A. Alberti et al.). An investigation into the performance of diffusion barrier materials against copper diffusion using metal-oxide-semiconductor (MOS) capacitor structures (V.S.C. Len et al.). TEM studies of the microstructure evolution in plasma treated CVD TiN thin films used as diffusion barriers (S. Ikeda et al.). Texturing, surface energetics and morphology in the C49-C54 transformation of TiSi2 (L. Miglio et al.). Sputtered tungsten films on polyimide, an application for X-ray masks (J. Ligot et al.). Polymer issues in nanoimprinting technique (F. Gottschalch et al.). Nanometer scale lithography on silicon, titanium and PMMA resist using scanning probe microscopy (E. Dubois, J.-L. Bubbendorff). Excimer lamp-induced decomposition of platinum acetylacetonate films for electroless copper plating (J.-Y. Zhang, I.W. Boyd). Oxidation of rf plasma: hydrogenated crystalline Si (S. Alexandrova et al.). Thermal behaviour of residual strain in silicon-on-insulator bonded wafer and effects on electron mobility (T. Iida et al.). Porous silicon—mechanisms of growth and applications (V. Parkhutik). Determination of the spectral behaviour of porous silicon based photodiodes (R.J. Martín-Palma et al.). Influence of carbon-containing contamination in the luminescence of porous silicon (R. Guerrero-Lemus). 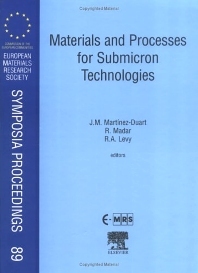 The European Materials Society decided to hold a Symposium entitled Materials and Processes for Submicron Technologies in June 16-19, 1998, within the yearly E-MRS Spring Meeting in Strasbourg, France. The purpose of this meeting was to discuss the results of the advances in microelectronic devices directly relating to the reduction in size of features of the devices down to submicron size. When electronic materials are patterned to these small sizes, their physico-chemical properties show many aspects (interdiffusion, electromigration, etc. ), many of these not well known yet. The articles presented in this volume, 28 in number, are representative of the 40 papers accepted for this particular E-MRS Meeting (Symposium N). For engineers and scientists specialising in the area of Submicron Technologies.